I need to get the 44Mag out to the range and figure out the drop past 100 yards. 240gr bullet has muzzle velocity of 1745fps. At this time, the Big Boy is zeroed for 50 yards. If zeroed for 100, it would have 18″ of drop by 200 (aim at the head, hit the chest) and 65″ of drop by 300 (aim half-height above standing silhouette). I am just curious about the practical use of this caliber at extended range. Bullet velocity even at 300 would still be higher than most 45ACP loads are at the muzzle. With shots all touching at 50 yards, I should be able to get them within a pie plate at 300 without much trouble once I figure out the holdover with the duplex reticle. This entry was posted in ammunition, rifle and tagged 44Mag, Henry, lever action. Bookmark the permalink. 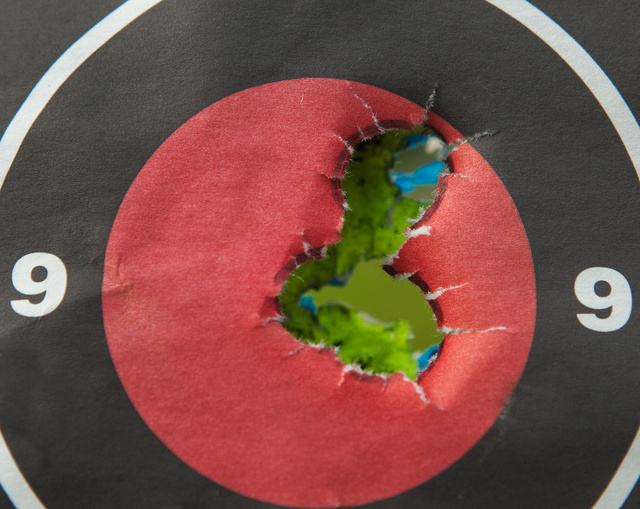 You need a peep sight for shooting one of these past 100 yards. I used to have a winchester ’94 44mag levergun. Fun as hell to shoot. Remember it is a pistol cartridge. At longer ranges you’ll be mortaring them in to the target zone. Big heavy slugs bleed off energy real fast. I used mine for hunting deer in very heavy brush and never took a shot from more than about 75 yards. Did I mention they are fun as hell to shoot? If you reload your own ammo you can work up some hot loads that will give you better LR accuracy. You might get a little “Flatter” with a 200 grain load, but I think the Drop would come quicker. As for it’s use, well let’s say a Draconian AWB come about. How would one defend oneself and Family in case the SHTF? Well, a good Bolt Gun with a Scope is great for the Long Distances, and Pump Shotguns are good for Short ranges, but what about the Middle Distances, say the 100-200 yard Zone that surrounds most Urban/Suburban Homes? Well, my Nephew who is going to Afghanistan with his Navy EOD Unit is facing that exact Dilemma. You see, when they come home, they are going back to their Base in Southern Kalifornia. He HAS to leave his ARs and his H+K Pistols here in Ohio, because they are Politically Incorrect in the Kalifornia People’s Republik. His solution was to buy a .357 Lever Gun, backed up with a couple of Good .357 Revolvers and a 20 Gauge Pump. (His new Bride is kinda on the Small Side, and with a Baby on the Way, she’ll need to use a Revolver if, God Forbid, she has the Baby in her Arms and the Goblins show Up). For faster Reload, we rigged up a Stock Pouch to hold some Bianchi Speed Strips to supplement what’s in the Rifle. Reloads work MUCH Faster with the Speed Strips rather than deed them one by one. And since the Ammo Supply is the same, it’s one less thing to worry about. He’s using 38+P for his system, BTW. Small Wife, new Baby on the way, you get the picture. So I don’t know if there are Speed Strips for .44 Magnum, but if there are, I’d use that Henry for a “Just in Case” system, along with a Good .44 Magnum Revolver. After all, I believe the people in New Jersey have had to use that kind of System for a few Decades, and it’s a hell of a lot better than calling 911 while holding a Hammer. Fire up the search engine and search on <> Yes, there is a workable design for one, a two-piece loading clip made from pieces of tube. With it all 10 rounds can be reloaded in a couple of seconds. The loaded speedloaders carry well in a modified quiver. I’ve even heard that these sell complete for $30/pop. Search on some cowboy-action fast levergun shooting. Go to Buffalo Bore and look up their 2000fps .357 levergun loads at around half-ton muzzle energy. At 100 meters, these loads will defeat soft body armor easily. The secret is ultra-hard cast loads, see Oregon Trail Laser-cast. BTW, cast loads will never be rated “armor-piercing”. There is a replica of the old Colt Lightning pump, even faster than the levergun, but about twice as much money and rare. Html did me in. That was supposed to read search on levergun speed loaders. Oleg, you scoped a .44 Mag Henry Big Boy? Go talk to the IHMSA Silhouette folks who use production .44 Magnum Desert Eagles and S&W Model 29s on the 200 meter rams. During the matches, they have to engage 5 targets each from 50, 100, 150, to 200 meters in the same heat. One advantage Silhouette shooters have is they know their exact target distance. They also know how many “clicks” of adjustment they need between the 50, 100, 150, and 200 yard targets. On of my first jobs as a teenager *mumble* years ago was setting up the 200 yard rams for tips. According to http://www.handloads.com/calc/ , that big .44 should be about 3″ low at 100, 24.25″ low at 200, and about 6 feet low at 300. Well, that’s with the calculated BC of a .429″dia 240gr SWC/Hollowpoint of .163 and a MV of 1775. That site isn’t too far off, until you start playing with some of the really silly super-low-drag bullet designs. I prefer the Strelok app on the Droid OS phones, but that website is close enough for rough guesses. It’s been a while since I zeroed my 20″ bbl Marlin 1894, and I need to do it again, but here’s what I put in my notebook: 1770 fps 240 grain SP zeroed at 130 gives a point blank range of 165. My range card says max line of sight front door=185 back door =205 so I’ll hold high center. FYI, Wild West Guns in Alaska makes a terrific ghost ring sight for the Marlins, no change necessary to the front sight. Don’t know if they have one that fits the Henry. Ed C, I think the new tactical 1-4x scopes are going to be perfect here. Glad to find out you are feeling better. I will certainly look at the optics when I am looking for scopes and mounts for the 300 Winmag. Maybe a volume discount?